BLACK Leaper badge for Jaguar F-Pace XF XE XJ and XK with Rotary Gear Selector. Fits ALL MODELS WITH ROTARY SELECTOR including Pre-Facelift and Facelift XF XE Models, essentially they will fit any Jaguar with the rotary gear selector. Gel topper cap for rotary gear selector on Jaguar XF, XE and XJ. Black, slightly domed. 41.5 mm diameter. Peel off the paper and stick down onto existing silver rotary top. Very smooth and pleasant to the touch, scratch-resistant, tear-resistant, UV resistant, non fading, slightly domed gel sticker. Photo examples are from XF and XJ. The growler also fits XK models with rotary selector. BLACK Growler badge for Jaguar XF XE XJ XK and F-Pace with Rotary Gear Selector. 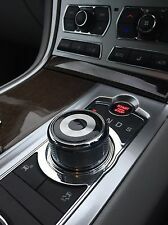 Fits ANY JAGUAR WITH ROTARY GEAR SELECTOR inc Pre-Facelift and Facelift XF XE Models. Photo examples are from XF and XJ. The growler also fits XK models with rotary selector. Fits both Pre-Facelift and Facelift XF Models and all Jags with rotary gear selector. Once fitted, the magic happens! Top quality gear gaiter made from 100% genuine Italian leather. The plastic surrounds or the gear knob is not included. Make: Jaguar. Leather Colour: Black. Stitching Colour:Black. Model: X-TYPE (2001 - 2009 ) only. 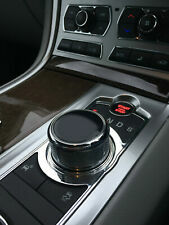 Gel topper cap for rotary gear selector on Jaguar XF. Slightly domed. 41.5 mm diameter. Peel off the paper and stick down onto existing silver rotary top. The non black ring is transparent so the silver is seen through. Very smooth and pleasant to the touch, non scratch, non fading. Photo examples are from XF and XJ. The growler also fits XK models with rotary selector. Red Growler badge for Jaguar XF, XE, XJ, F-Pace and XK with Rotary Gear Selector. Fits ALL JAGUAR CARS WITH A ROTARY GEAR SELECTOR including Pre-Facelift and Facelift XF XE Models. New BAS headrest foam & covers for Jaguar E type, Will fit other cars of that era. Jaguar F-Pace, F-Type,S-Type,XE, XJ 2013-up, XF 2016-up ,XK,Etc. (dose not fit for 2011-2015 XF). 1 x Jaguar Shift Knob Gear Emblem Sticker. Easy installation, self adhesive tape is included on the back of the Badge. Photo examples are from XF and XJ. The growler also fits XK models with rotary selector. • They simply stick on top of the rotary gear selector without any modification. Once fitted, the magic happens! Gear Gaiter For Jaguar X-type 2001-2009 Cream Leather New. The plastic surround or the gear knob/handbrake handle are not included. You can simply reuse the old parts from your car. Leather Colour: Cream. SIZE: 42MM. 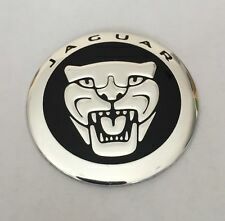 JAGUAR SGEAR KNOB BADGE. We will reply back to you instantly. Easy To Fit With Strong Adhesive Tape On Back. JAGUAR X-TYPE GEAR KNOB. 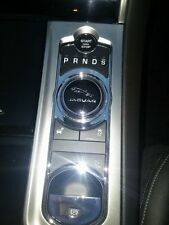 JAGUAR XTYPE GEAR KNOB CENTRE. DIESEL 5 SPEED MANUAL IN GOOD CONDITION AND WORKING ORDER MAY HAVE A FEW AGE RELATED MARKS. Original gear knob from my 1993 XJR. Leather in good used condition. This is for a pair of seat belt pads Fabric Essential Seat Belt Pads Black 1 pair are quick and easy to attach and remove with Velcro fitting to provide extra comfort when driving. 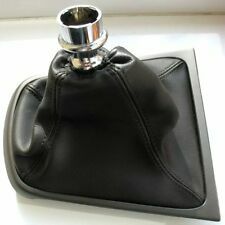 Black in colour, suits most car interiors Includes two pads, one for you and your passenger Velcro fitting that can be quickly attached and removed. Box contains: 1 x Gear Gaiter. Leather Colour: Champagne Beige. Stitching Colour: Champagne Beige. JAGUAR X-TYPE ( 2001-2009). We specialize in customisation of car interior but also in creating unique and personalized products made of genuine leather or suede material. Jaguar xjs pair of kick plates in used condition with light scratches and a little mark (please see pics). Box contains: 1 x Handbrake Gaiter. Part compatibility: JAGUAR X-TYPE (2001-2009). We specialize in customisation of car interior but also in creating unique and personalized products made of genuine leather or suede material. Fits：XF XE XJL XJ. 1 pcs Red jaguar sticker. Top quality gear gaiter made from 100% genuine Italian leather. The plastic surrounds or the gear knob is not included. Stitching Colour:Black. Make: Jaguar. Leather Colour: Black. Model: X-TYPE (2001 - 2009 ) only. Jaguar F-Pace, F-Type,S-Type,XE, XJ 2013-up, XF 2016-up ,XK,Etc. 1 x Jaguar RS Sport Logo Shift Knob Gear Emblem Sticker. (dose not fit for 2011-2015 XF). Easy installation, self adhesive tape is included on the back of the Badge. Jaguar F-Pace, F-Type,S-Type,XE, XJ 2013-up, XF 2016-up ,XK,Etc. (dose not fit for 2011-2015 XF). 1 x Jaguar S Logo Shift Knob Gear Emblem Sticker. Easy installation, self adhesive tape is included on the back of the Badge. Photo examples are from XF and XJ. The growler also fits XK models with rotary selector. Once fitted, the magic happens! It looks like it should have always been there. Fits all Pre-Facelift and Facelift Models as long as you have rotary gear selector. XJ, XF, XK, S-TYPE. CAR INTERIORS AND SEATS. LEATHER RESTORATION BALM are not formulated to change the colour of the leather but are intended to enhance the original colour. Leather cream balm – 50ml. XJ, XF, XK, S-TYPE. CAR INTERIORS AND SEATS. - It's easy use joined to the excellent spreading, improves the look of the grain, giving a very fine, natural glossy to the leather with a silky touch. LEATHER RESTORATION BALM are not formulated to change the colour of the leather but are intended to enhance the original colour. You are buying the following items. 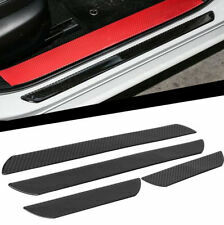 1x Gear selector topper badge 1x 10 set peice rubber mat bundle for interior like cuoholder etc. 1x Steering wheel sticker badge. Please note pic 8 is just and example and the sticker badge you are buying is am XF one not and S one. HERE WE HAVE A CLASSIC WOOD JAGUAR COVENTRY LOGO GEAR KNOB TO FIT THREADED LEVER FROM 6MM TO 9MM HAS TAPERED PLASTIC INSERT WHICH CUTS ITS OWN THREAD AS YOU SCREW IT ON.THIS WILL NOT FIT MODERN JAGUARS ONLY CLASSICS. Box contains: 1 x Gear Gaiter. Stitching Colour: White "X-TYPE" Embroidery. JAGUAR X-TYPE ( 2001-2009). We specialize in customisation of car interior but also in creating unique and personalized products made of genuine leather or suede material. Some of the lacquer has chipped off so will require some polishing work to be done. The veneer itself is fine please see pictures. Thank you. AUTOMATIC WOOD GEAR KNOB REMOVED FROM A 2002 JAGUAR X TYPE 2.5 V6 4 DOOR MANUAL CAR. XJS, 1993, ANT Light Doeskin. Doeskin [AEE]. pale green/blue. Jaguar 70’s Buckskin [AFR]. Jaguar Colours include the following but the list is too extensive to publish. Jaguar MKII,1966, Dark Suede Green. HIGH QUALITY GEAR GAITER COLOR BLACK. The plastic surrounds or the gear knob is not included. JAGUAR X-TYPE 2001 TO 2009. BLACK LEATHER WITH BLACK DOUBLE STITCHING. 100% REAL GENUINE LEATHER. These are made from genuine Italian leather. JAGUAR X-TYPE 2001-2009. And what you will receive is only the leather part. Black leather with black stitching. Box contains: 1 x Gear Gaiter. Stitching Colour: White. JAGUAR X-TYPE ( 2001-2009). We specialize in customisation of car interior but also in creating unique and personalized products made of genuine leather or suede material. Chrome Car Gear Shift Knob Cover Decoration Sticker Car Interior Moldings For Jaguar XF XE XJ XJL F-PACE Accessories Car Styling Features 1.Item:Car Gear Shift Knob Cover Trim 2.Brand New and High Quality 3.Perfectly compatible with for Jaguar XF XE XJ XJL F-PACE 4.Easy installation,with high quality 3M stickers,no drilling required Notice: 1.Before installation, please keep the surface clean and dry, no sand/dust. 2.Under 15 degrees Celsius, you can use a Hair dryer to warm the product and adhesive tapes up before installation. 3.Please keep the product out from moisture and dust within 24 hours after installation.